With a move to a new home looming on the calendar, the layout work has stopped. In mid-April, my wife and I decided to have a few areas of the new house upgraded before moving in to live. As I am between employment opportunities, I could be on site to answer questions and keep the work moving forward. I set up a small table into my new hobby space along with some basic tools and a few resin kits. I started building on April 28. Along the way I learned a great deal and enjoyed almost every kit. The dates noted are when the build for each kit started. Both of these kits were purchased at a Railroad Prototype Modeler meet where the F&C folks frequently offer special kit deals. Both kits were in the lower priced bagged kit selection and purchasing two or three brings the per kit price down a notch or two. The Rutland gondola was the first kit to be freed from the bagged container. The parts and directions were reviewed before trimming resin flash from the larger parts. These get a wash and gentle scrub with dish detergent and a one soft bristle toothbrush before assembly. Here’s what the underframe looked like after flash removal and a wash. Click on any image here for a large view. Side and end pieces were carefully sanded so they were the same length and these parts were assembled to form a box. In many resin kit builds, I use Barge Cement to create a more durable attachment between side and end parts. Small amounts of this contact cement were applied to the joining surfaces. I use a short piece of twenty-thousandths wire to apply a very thin film to the surfaces where the parts meet. After allowing 15 minutes to dry, these parts are lined up and attached. The contact cement allows a little time to adjust the fit but it does set pretty quickly. I follow through on the kit instructions for the build, but I use Accurail Proto:HO couplers and drill holes to mount these securely. Holes are drilled in the bolsters and tapped for 2-56 screws in preparation of the truck installation. By this time, the glue has set and the box of sides and ends can be attached to the underframe. Check for a good fit and mark in pencil where the underframe components meet the side sills. 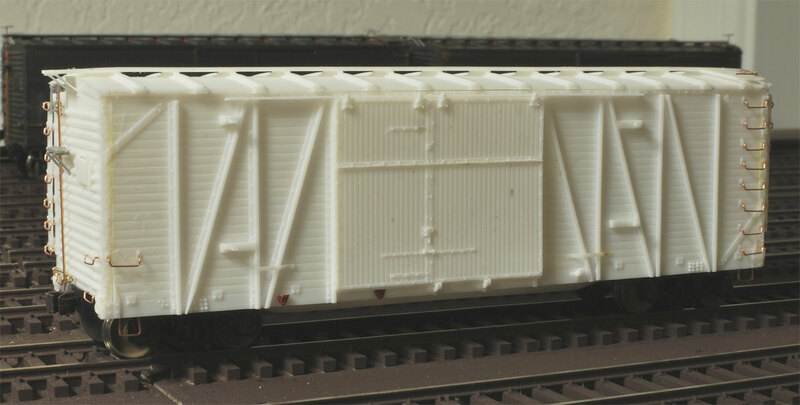 The underframe may be slightly long and need to be sanded to fit, or it may be a little short and some strip styrene will need to be added so the fit with the body parts is snug. This is one of the realities of resin kits as the cast parts can shrink at different rates after the casting process. After you do this once or twice, it becomes old hat and another kit building technique becomes a part of your arsenal. A few holes for the grab irons and some work on the brake system moves this kit along quickly. It ends up looking like this. 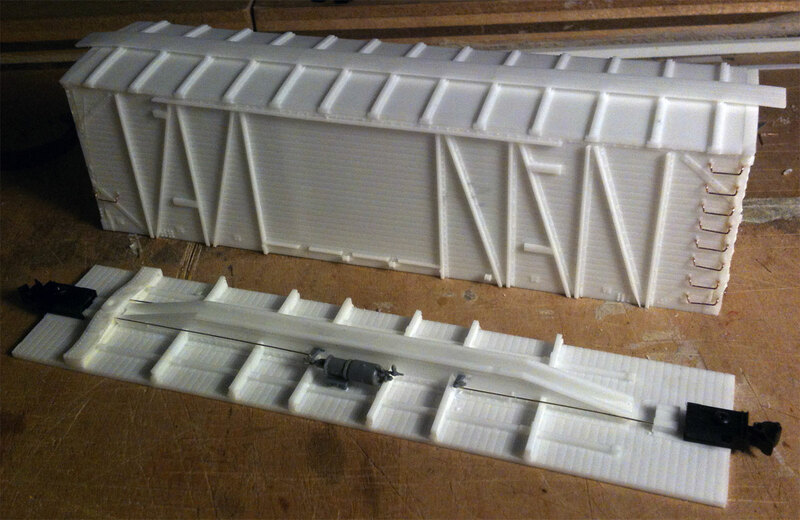 With any resin freight car kit there will be steps where several fiddly bits are installed on the model. The grab irons on this model are an example of this, but with patience you can work through these steps. A variable speed motor tool can make quick work of drilling holes. I keep a small cake of beeswax nearby to keep the small drill bits lubricated. These steps can tax your patience and I recommend taking a break when you start feeling frustrated with the build. Get a drink of water, walk the dog, or go fetch the mail to give your mind a breather. The prototype Rutland cars were converted from flat cars in order to haul crushed stone. The 1926 Official Railroad Equipment Register lists two series of cars for interchange service, Rutland 3000-3028 and 3050-3059 for a total of 39 cars. The probability of these short, wood gondolas venturing very far from Rutland rails is pretty low, but this is a very good kit as an introduction to resin freight car kits. There are few small parts and extra details to add. I completed this car in just a few days working around a couple of other projects. I did not add weight to the gondola and will use a load of cut curbing to add weight. This is a unique car that is a nice addition to a model railroad freight car fleet. As an extra bonus, there were decals for the New England, Berkshire & Western included with my kit. I may use these to pay homage to the prototype modeling efforts of the Rensselaer Polytechnic Institute model railroad group. Wabash automobile box car in early build phase. While working on the Rutland gondola, I started an F&C Wabash automobile box car. I read through the directions then removed the flash from major parts; sides, ends, underframe, roof, and running board. These were washed and set aside to dry before assembly began. The sides and ends were glued into a box following the same procedure as the Rutland gondola assembly. There are more grab irons to install and care needs to be taken using shorter grab iron legs at the corners where ladder grabs are on both faces of the car. There were additional fiddly bits to this kit. The small door stops offer a challenge and my kit lacked a pair. The doors were too tall to fit into place, so I carefully sliced the bottom rollers from the bottom of the side sill and reinstalled them after the door castings were attached. One car side was missing a couple of these bottom rollers, so I pirated a similar pair from my box of old kit parts to install. They are the red parts in the photo below. Fitting the brake hardware assembly is also tedious, but with care all the parts fit well and look great. You really can’t rush through these steps in order to build a nice looking car. I took several breaks and often prepped the parts of another kit to clear my mind. Here’s how the Wabash car looked after all the fiddly parts were completed. The Wabash automobile box car is ready for the paint shop. The Wabash added a large number of 40-foot, door and a half, single-sheathed, automobile box cars to their roster in the 1920s through the 1930s & 40s. Many were built after my 1926 focus and had Dreadnaught metal ends and Youngstown metal doors. I chose this kit because the Murphy corrugated metal ends and wood doors were used on prototype cars built before 1926. These are details I try to be wary of as the freight car fleet expands. There are more resin freight car builds to share soon. Please post any question or comments below. All comments are reviewed and approved before they appear. I’m some sort of inseparable mixture of modeler and cottage manufacturer. Soon, I intend to begin offering piggyback resin kits in several scales. I have not yet begun but will read every word of your four-part blog on resin model construction. Just wanted to say thanks much for publishing your findings. In my case, I wish to do my very best in providing easy-to-assemble resin kits. I’ll bet your blog will be of keen interest and great help to me. Previous Previous post: Late May layout update!